A crazy caper involving lots of adventures plus journeys on many different types of transport. There is even an elephant involved! Can Phileas Fogg win his bet to go around the world in 80 days or will he lose his life’s fortune? Plenty of laughs as you accompany Fogg and Passepartout on their manic trip around the globe. THE Garrick Playhouse succeed in taking us around the world in two hours when they present Laura Eason’s version of the Jules Verne classic, Around the World in 80 Days. This remarkable, fast-paced production is a fun adventure. With just six cast members playing over 100 characters, simply by swapping clothes and props, they achieve a feat as impressive as the fantastical voyage itself. The leading character is Jamie Sloan’s Phileas Fogg, who takes a bet from the Reform Club’s whist section, to circumnavigate the globe in record time. His modes of transport include trains, a ship, a sleigh and even an elephant. All are created simply and effectively, often by the versatile use of suitcases. Jamie illustrates a well-heeled gentleman with a stiff upper lip. He has, until his adventure, been set in his ways. But travel changes his attitude, if only slightly. But Phileas Fogg would be helpless without his faithful valet, Passepartout, brought to life by an acrobatic Tim Cooper. An ideal choice to play a former circus performer, his physical contortions are fascinating. As Fogg’s comic sidekick, he puts keeps the audience constantly amused by rescuing his boss from a series of unfortunate situations. Mark Jephcott is impressive as the wily Inspector Fix, who uses every trick to delay the pair of mavericks in his relentless pursuit to arrest Fogg. Laura Crow is also delightful as the beautiful Indian woman who joins them on their adventure after they dramatically rescue her from a funeral pyre. Even the music is appropriate and this is just one of the many threads drawn together by director Celia Bonner. This is a show which the whole family will enjoy. IT’S two relative newcomers who light up the Garrick stage in this engaging, vibrant and gloriously tongue in cheek adaptation of this globe trotting classic. They are Jamie Sloan, a perfect piece of casting as Phileas Fogg, a buttoned up quintessential English toff and Tim Cooper as his valet, PassePartout. They made their respective debuts at this theatre in 2016 and 2018 respectively and together they make such an engaging double act I for one hope they work together again, very soon. Sloan had me totally convinced as Fogg, a stickler for routine who takes up the offer of a daunting bet, while Cooper combines a boundless energy with a sense of comic timing that is, quite simply, exemplary. It was pleasing to see so many children in the audience for a production that can be enjoyed by all the family, a phrase that in my experience has often been shorthand for mindless and moronic entertainment. But Director Celia Bonner’s production is perfectly paced and includes a very clever use of props to denote the various exotic locations Fogg and his trusty sidekick find themselves in. But this is far from the Sloan and Cooper show, with the entire company providing a real antidote to these dark early autumn night. Hot on the heels of Fogg and PassePartout is old school policeman Inspector Fix, perfectly played by the always watchable Mark Jephcott. Fix believes Fogg is a criminal on the run and he inevitably ends up embroiled in the duo’s increasingly exotic adventures. Light entertainment at its best – make sure you book for this fantastic theatrical journey. 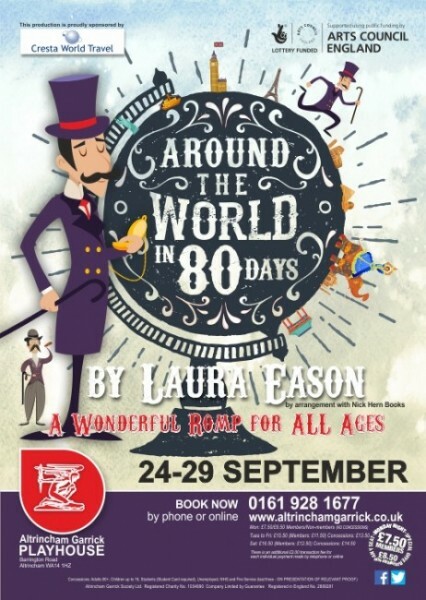 Around the World in 80 Days is a rather new play, only first published in 2013. However, the book on which the play is based on was originally published in 1873. It tells the story of Phileas Fogg (Jamie Sloan) who bets his fellow card players £20,000 that he can make it around the world in 80 days. To a person living in today’s world travelling around the world in 80 days may seem very easy, however one needs to remember this story is set in 1872 – years before the first flight took off. So instead Fogg makes his way around the world travelling by train, boat and even hitches a ride on an elephant. While watching the show it appeared as if we were going on a journey that are historic to British people for one reason or another. We visit some of former colonies; India, New York and Hong Kong. Even though the story is set over 100 years ago, it was nice to add some modern touches to this production, most notably the inclusion of ‘My Heart Will Go On’ from the movie Titanic while the cast were on one of their boats. All of the cast did well in their respective roles, Sloan never strayed from his English gent ways. However, a special mention has to go to Ben Hanley who played the role of a Porter. You could tell he was absolutely loving it. It was really nice to see someone who didn’t having a speaking role to make as much of the role as he could. The turnout was fantastic as ever at the Altrincham Garrick. They audience received the show really well – they clapped along and got involved when they were told to. I’m sure the audience helped put the actor’s nerves at ease. Margaret Norris did a great job on designing the set. I was not expecting to see such an elaborate set. The rustic staircase and map really helped set the tone and era for the piece. There was a moment when the cast asked a member of the audience to join them on stage to help control the boat in choppy waters. This was absolutely hilarious. However, the actors carried on with their dialogue while the audience were still in stitches watching a grown man pretend to hold down a table on-board a ship. I for one was so wrapped up in what the man was doing I missed all the dialogue – I even whispered to my friend “I hope they didn’t say anything important because I wasn’t listening”. On a couple of occasions I felt the narrative was moving too fast and we didn’t get a true representation of each area visited. The visit to India was great and we got a true sense of the Indian culture, but I feel like none of the other visits came close to that in terms of exploring the locality. Around the World in 80 Days in a very fast moving show and this ensemble certainly did make the most of it. I did get lost a few moments on the way, however on the whole it was very enjoyable.